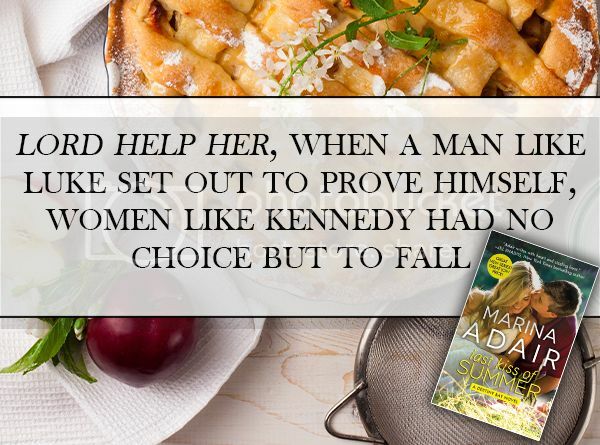 Last Kiss of Summer by Marina Adair is the first in her new series Destiny Bay about a woman trying to find her place in the world. Kennedy Sinclair has just lost her boyfriend of 4 years to their dance instructor when she makes the decision to move across the country and take over a family friend’s bakery. 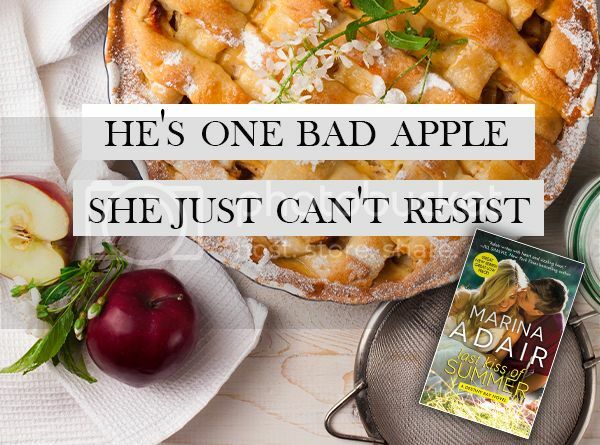 Luke Callahan is trying to keep his orchard out of the red, build a cider business, and get his mom her summer home back when he finds out she sold her bakery to some city girl along with three acres of apples he needs to save the orchard. Now it comes down to a battle of who gets the apples: the determined Kennedy or the desperate Luke. I SO enjoyed this book! I enjoyed it so much that I read it in one sitting, loving every word. The chemistry between Luke and Kennedy is sweet, swoon-worthy, and irritating all at the same time. From their first encounter to their first kiss I was rooting for them to succeed. Alone the two characters are broken, missing something they don’t realize they need. Together they find their missing piece. It’s heart-warming and breaking all at the same time, as they are on opposing sides, pitted against each other. Kennedy is a wonderful lead character. She’s had a rough life, a life filled with people leaving her, which has left the grown woman with a lost little girl at her heart. Yet she’s tough, independent, and determined (which is just a better version of stubborn) to find a place she can call home. Luke is swoon-worthy from the moment he steps on the pages. He’s a tad arrogant, but has a giant-sized heart. After his dad’s death, guilt has ate away at him and he feels responsible for his family. This is endearing to me and made my heart ache for him. His determination to save his family’s orchard and get his mom’s summer home back is so incredibly sweet. Overall I really loved this book. The sweet romance that blossoms between Kennedy and Luke, while predictable, was heart-warming and had me rooting for them. The small town charm of the town Destiny Bay reminded me of my own hometown and how nothing is better than realizing they have your back. If you enjoy contemporary romance, I highly recommend you grab a copy! It doesn’t disappoint.